So head on over to see what I came up with! Perfect for a beautiful fall wedding...or winter! Such rich colors. love yours!! love this room too...can i move in? just checked it out...so hot! Linds - HOW did I miss the news of your engagement? I'm so sorry I've been away from the blog, and didn't have a chance to say Best Wishes to you and your lucky guy! ben stiller's residence? wow. love the warmth. Love this warm, and rich room! Lots of books. Love it! 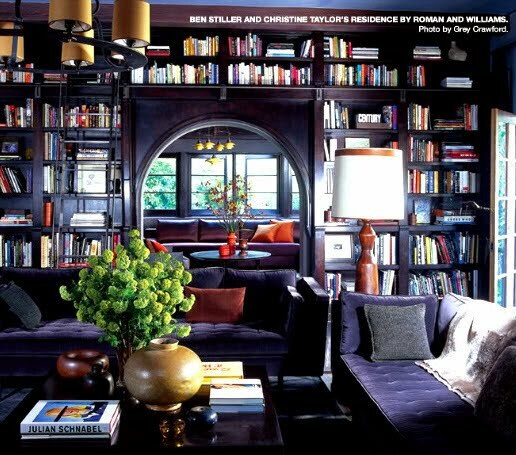 Love the richness of this room! So chic! Good job on that Lindsay. You converted a beautiful room into a very pretty wedding. I left a comment on the that post saying that we can't wait to see what you come up with your very own, and I can't...so much fun. OMG, this is one of my favorite rooms. I have this ripped from (Elle Decor?) in my inspiration binder. great post Lindsay!! Love the greens and especially the Louboutin! Loved this post. Very glamorous! You did a great job - totally elegant. It's traditional, yet unexpected. Bravo! GORGEOUS! I love these hues.